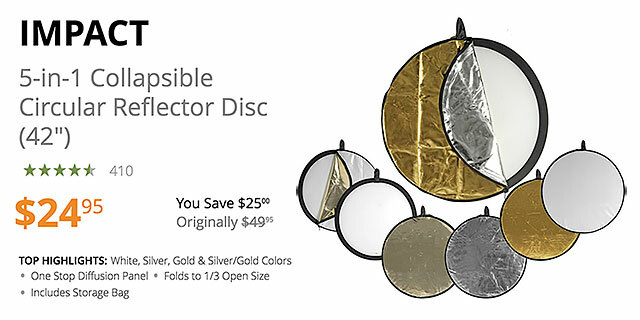 Impact 5-in-1 Collapsible Reflector Disc provides shadow-lightening detail in your subject, using available or studio lighting. It starts out as a translucent white disc – perfect for softening direct sun, or lights without diffusion. Use the removable, reversible zippered slipcover to reflect light into shadow areas of your subject. Your choice of color – silver, gold, white, silver/gold mix – will be determined by the lighting conditions, and your personal preference. This 42″ disc is suitable for 3/4 length portraits, and medium still-life setups. It folds down to 1/3 of its open size, and comes with a storage sleeve. 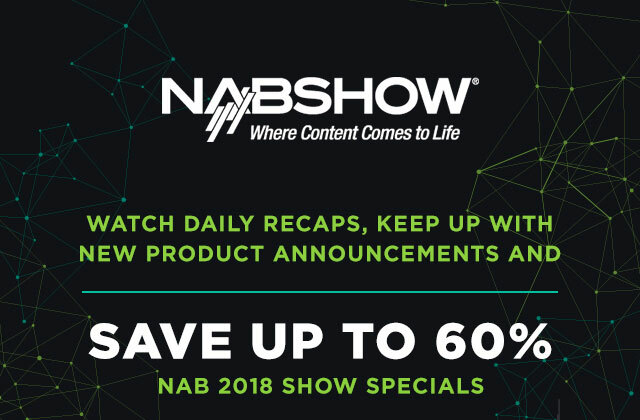 Even if you can’t make it to NAB 2018, you can SAVE with NAB Show Specials on Cameras, Video, Lenses, Lighting, Audio & Computers! 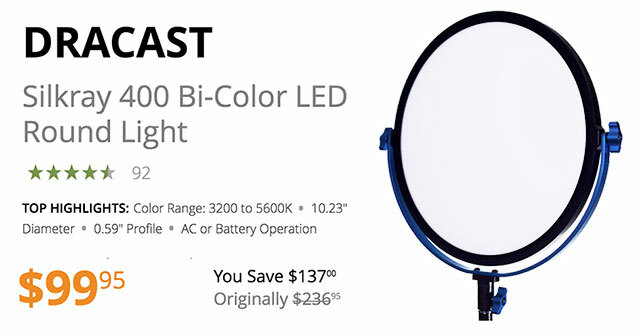 10″ Dracast Silkray 400 Bi-Color LED Round Light Under $100 Today Only! 10″ Dracast Silkray 400 Bi-Color LED Round Light has 3200-5600K variable color temperature for matching ambient lighting, other lights or just for creative color. No filters are needed; just dial it in. Brightness is variable too, from 0-100%, avoiding the need to use scrims or moving the light back and forth for the right illumination. The Silkray’s size and shape are unique factors. The diminutive 10.23″ diameter disc is a little over 1/2″ in thickness, and since its LEDs are barely warm to the touch, the light can be squeezed into places where traditional light sources just can’t go. Add to that the fact that the Silkray 400 can be separated from its yoke, and you have a light that can almost literally go anywhere. It comes with a 100-240 VAC power adapter, ready for worldwide use, but it can also run on optional NP-F type camera batteries when mains power is unavailable. Limited Time Only! 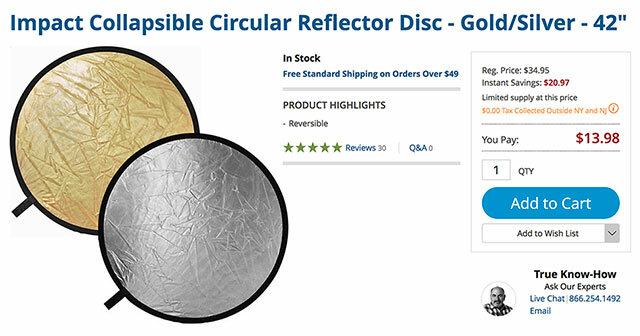 Save $20.97 on this 42″ Reversible Gold/Silver Impact Collapsible Circular Reflector Disc – just $13.98 while supplies last! Limited Supply – Grab it Now! Flashpoint XPLOR 600Pro TTL compact 600 watt/second flash – available paired with a R2 Pro Radio Transmitter for Sony cameras ($968) recycles in under a second at full power and features stable color output, real modeling light power from an LED, an integrated reflector along with classic Bowens mount, and superior flashtube performance. The first XPLOR600 proved the power of R2 to master the light wirelessly, and now, the XPLOR 600Pro goes beyond, adding sleek design, practical control consolidation and responsiveness. True accurate TTL, lithium powered mobile imaging that spurs your creative imagination to conquer distant vistas, solve the challenging lighting situation in any environment, adapt to multiple camera systems right out of the box. The R2 Radio System links Canon, Nikon, Sony, Fujifilm and Olympus/Panasonic seamlessly for the ultimate to remote solutions. It features HSS up to 1/8000s and a new integrated reflector along with compatibility with the full line of Bowens mount light modifiers. Battery recharge using the external power charger can reach full capacity in less than 2 hours. You can exchange a depleted battery-pack in a matter of seconds to keep pace with whatever you’re tracking. Pro 38w LED modeling light, with proportional, variable or recycle responsive settings with a cool bulb that produces a tungsten equivalent of 400w. The XPLOR 600Pro TTL is the next evolution of the Flashpoint R2 radio system, compatible with the R2 Canon, Nikon, Sony, Fujifilm and Olympus/Panasonic TTL auto flash systems, for remote power control and shooting. 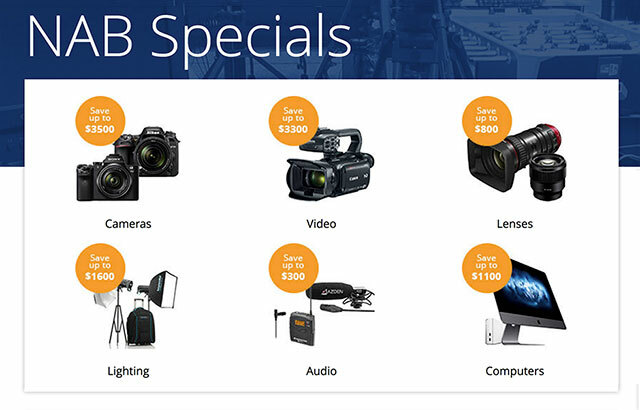 With a focus on portable lighting, the R2 Family liberates you from the hassle and tangle of hot, wired 600ws monolights – whether you are a wedding or event photographer, environmental portraiture shooter, freelance commercial studio illustrator, eager photojournalist, a wandering backpack adventurer, or fast action sports shooter. You can Link to simultaneous multi camera systems without the need to re-sync! 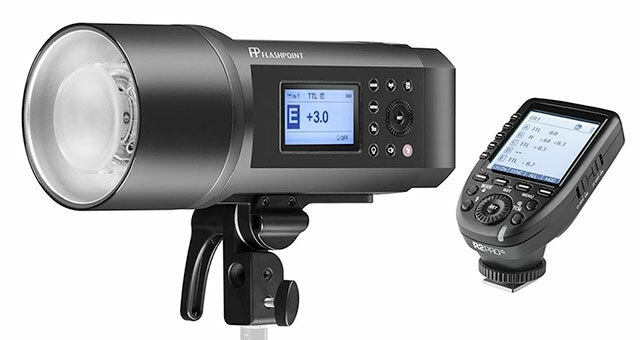 This XPLOR 600Pro TTL can be linked and synced to be triggered wirelessly in complete TTL operation with any R2 transmitting member of the R2 Family: The prodigious Flashpoint models of Streaklight 360, Zoom Speedlights, R2T and R2Pro Remote Transmitters – all work seamlessly to clear the path onto the challenge of mastering the light, wherever you go. The R2 TTL Wireless Flash System is the advanced 2.4GHz radio remote that adds camera TTL dedicated custom functions to your multi flash experience. Easy to use buttons command a full range of functions like reliable channel triggering, group mode selectivity, HSS, all with powerful signal strength and exceptional stability to your selected camera flash language. LED panels clearly display the status of all remotely linked R2 compliant strobes so you always have control of group lighting mastery. R2 wireless communication gives speed of light response to on camera or off camera R2 Family devices for a spectacular advantage on the shoot in any environment. The proprietary TTL and HSS enabled 2.4GHzR2 Radio Remote System transmits atop a modern DSLR body with reliable TTL and pass-through to speedlights, plus laser AF assist. R2 transmitters work with the complete family of Flashpoint Zoom Speedlights, XPLOR600 Monolights and Streaklight Strobes with R2 TTL radio transceivers built right in. Add a R2 receiver to any legacy flash with a sync port and it too becomes part of the R2 Family! The incredible range of these compact and lightweight units as well as their integrated functions and features make them the first choice of professional photographers. 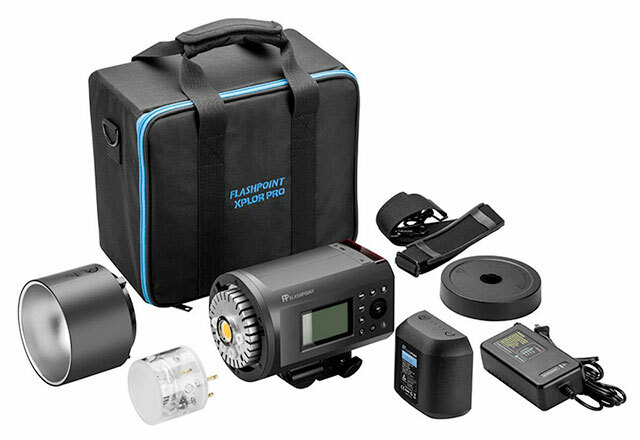 The new Flashpoint R2 Pro wireless flash trigger, the ultimate dedicated light master for The R2 Family of Flash. Boasting sparkling innovations that make the art of photography easier than ever, at the touch of a button. Like the essential TTL tool, TCM. TCM fusion takes TTL to a new level, overcoming the exposure fluctuations that may occur in TTL shooting by saving the successful exposure value to Manual settings for repeat capture accuracy.